A North Texas mother is hospitalized after her ex-husband came to her home early Wednesday and opened fire, injuring her and killing their three children and her boyfriend before turning the gun on himself, sheriff's deputies say. The identities of the children were confirmed by the Tarrant County Medical Examiner's Office Thursday as Drake Painter, 4, Caydence Painter, 6 and Odin Painter, 8. The mother who survived the shooting is identified as Amanda Simpson. Wednesday night, she posted a public Facebook video showing her sobbing from her hospital bed as she held a photo of her three young children while talking about her troubled relationship with her ex-husband. The Denton County Sheriff's Department identified her ex-husband as Justin Painter. Investigators believe he was the gunman. In the Facebook video, Simpson said she spoke with Painter on Tuesday and that he wanted to reconcile, but she said no. The Ponder Volunteer Fire Department said Wednesday morning they were called to a home in the 600 block of Lone Star Park Lane at about 8:30 a.m. Shortly before arrival, firefighters were told there were multiple victims inside the home and that several ambulances had been requested. 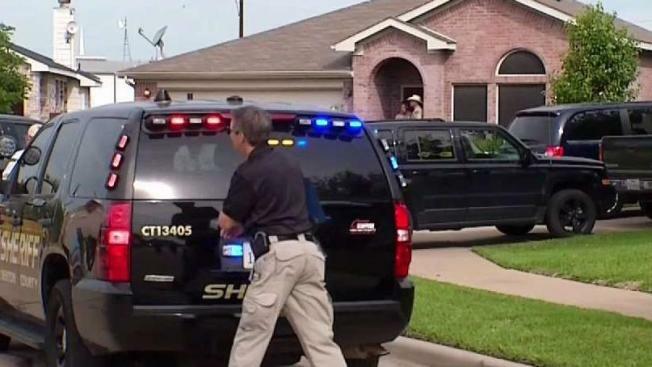 Officials with the Denton County Sheriff's Department confirmed to NBC 5 later in the day that the five people found dead inside the home were three children, their mother's boyfriend, Seth Richardson, and their father, Justin Painter, the suspected shooter. The mother of the children was also shot but survived the shooting. She was transported to Medical City Denton. In the Facebook video she posted, Simpson said she'd been shot in the shoulder, that the bullet lodged there, and that she may have to have surgery. Wednesday evening, neighbors held a vigil, gathering at a gazebo near the family's home. They left stuffed animals, crosses and prayers for Simpson and her family. "All of us are letting her know that we're praying for her and I cannot imagine losing three children," said neighbor Katie Garcia. Residents told NBC 5 that Lone Star Park Lane is a generally a quiet, middle-class neighborhood and that they were surprised to learn of the violence. "It’s a family-friendly environment to live in and it’s sad that it happened here," said resident Mark Skaggs. "But this happens all over the place." The Denton County Sheriffs Office is assisting Ponder police in the investigation. Further details about the investigation or what may have taken place inside the home have not been confirmed. NBC 5's Seth Voorhees, Maria Guerrero and Alice Barr contributed to this report.